← RC Cola Biggie Is Now Available! Our young man finally got his wish: a box of Krispy Kreme Monsters University Doughnuts. He was feeling a bit indisposed when he arrived home from school last Wednesday, and I thought, what better way to cheer him up and make him feel better than to give him something that he has long been asking us to buy him. In terms of taste, our son favored Mike (the green character) and Squishy (the pink character), but design-wise, he said he liked Squishy of all the Monsters University characters. He ate seven of the eight donuts: three on the night he was sick, two during recess in school the next day and the other two as his afternoon snacks at home. He’s now asking us to buy him another box of these cute and loveable Monsters University doughnuts. 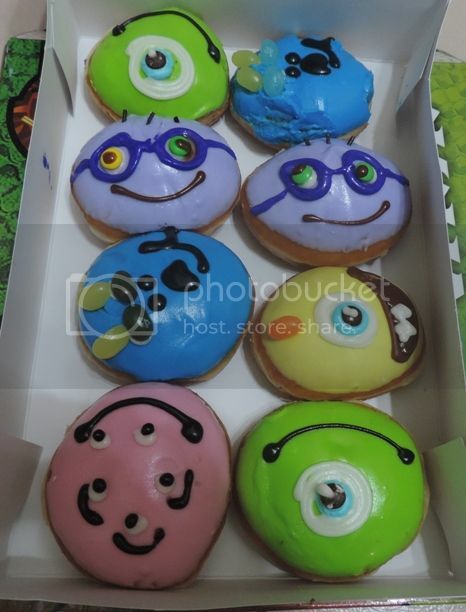 Do your kids like Monsters University Doughnuts, too? This entry was posted in Food Friday, Food Trip Friday, Krispy Kreme, Monsters University Doughnuts. Bookmark the permalink. we haven’t tried them yet. am afraid my sons are not really donut fans…ako lang! lol. would love to try these! glad to know your young man’s feeling better!